I know. It’s been a while. There has been mentalness (is that even a word?) here. Work is crazy busy at the moment with the onslaught of manic students who didn’t quite make the grades for their chosen course at the University of Liverpool, so want to come to use for their foundation year so they can eventually get where they want to be. It’s madness I tell you, madness!! Which would be the loverly Louise having a bash at Guitar Heroes III (after a day long drinking session…. In the rain!). The Eclectica Music Festival 2008. You might recall we went to this event last year and saw Echo and The Bunnymen, and more importantly The Lancashire Hotpots perform. This year's headliners were The Levellers (sounds of an era!) and Shed Seven. Louise and Rob managed to off load their kids overnight, as did we (thanks Nanny Winne and Nanny Tish :)) so we were let loose out on the lash sans children for once. It was great to get together with Lou and Rob and not have to worry about whether the children were trying to kill each other, or skydiving off the furniture. Paula and Karen in the pub before the gig started. Gotta love the look on Rob’s face in this one! Kendo. Ste. Rob. Aka “All the beards on one side”. Shed Seven on Stage. Only me and Paula were nuts enough to brave the rain on this one. The rest of them stayed in the pub. WIMPS! Yes. It really was wet enough to warrant a Kagool. With the hood up. Despite the crappy weather, we really did have a great day out. Roll on next year I say. The only thing slightly marring my Saturday fun was the knowledge that I had to get up and go to work on the Sunday (I know. Work! On a Sunday! Goes against my very nature!) 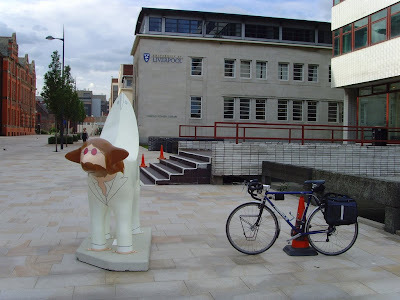 I had to head up to the University of Liverpool for the day to check on the results of the people who had been made offers on our Foundation courses. As work days go it wasn’t that bad, but still. Sunday? That’s not good in any shape or form. 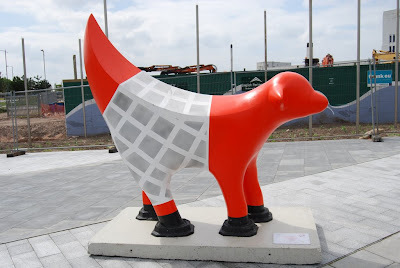 It’s a Superlambanana. Obviously. 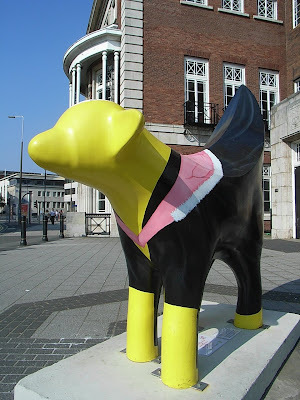 There are loads of these around Liverpool and the surrounding areas, all decorated differently, as part of the 2008 European Capital of Culture celebrations that are taking part in the city this year. They don’t really serve any purpose. They’re just cool! And my absolute favourite, this one. Which is situated on Edge Lane Drive, the main route into Liverpool, which is undergoing some serious redevelopment. My completely chaotic couple of weeks has been topped off by the discovery that my car is poorly. Very poorly. Poorly in the “might cost more to fix it than it’s actually worth” sense. I’m rather sad about that, because I like my car a lot. It won’t start at all and it seems there’s a problem with the Nissan Anti-theft System that is has (which has to be dealt with by a super duper Nissan diagnostics computer). It’s going to the garage this week, but it doesn’t look like there’s much hope at the minute. Looks like it’ll be the bus for me for a while *shudder*. LOL, I'm more amused by Rob's 'rock n roll side of the stage' pose - no bucket of Jack Daniels for my hubby when a nice cup of Yorkshire Tea's on the go! Also love the pics of Karen and Paula and 'the beards'!! Quite disturbed by the superbanana things; you're a strange lot over them there hills tha knows!! My word, you have been busy! 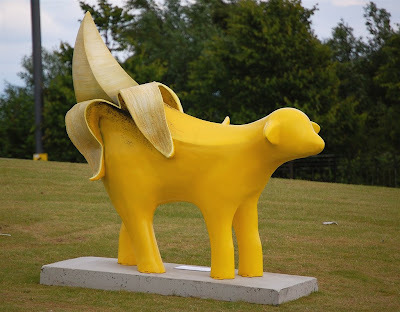 I am totally tickled by all the superlambbananas - my sis keeps texting me pictures of them on her travels! Oooh that takes me right back! I saw the Levellers way back when I was at uni and they were fab - well worth standing in the rain for!